Way back in 2008, miners recovered three fossils from a gold mine in the Klondike, Yukon. These were among the first Western Camel bones to be found in the territory or Alaska in decades. For ages, scientists had believed that Western Camels, which once lived in North America were related to Llamas and Alpacas that are much common to South America; however with the discovery of these fossils scientists have got a genetic proof which indicates that the extinct animals were much more related to the Asian and Arabian camels. A paleontologist with the Yukon's Department of Tourism and Culture, Grant Zazula, said: "For us, the gold is the fossils because it's this incredible resource for understanding extinct and ancient animals of the ice age." 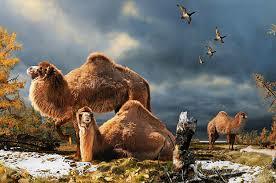 These Ice Age Camel bones are now forcing scientists to redraw the lineage of the now-extinct species says Zazula. Zazula further said that with this discovery scientists can now try to figure out what could have probably led to the extinction of these camels towards the end of ice age which is 13,000 years ago. Over the past century, Paleontologists have tried to study camels using comparative anatomy, wherein they divided bones and fossils into two main branches of animals basically found in various regions such as Arab, Africa, Asia and the llamas and alpacas which are found in South America, said Zazula. He further also added that earlier paleontologists believed that western camels were like "giant llamas" or "llamas on steroids". The discovery of uncovered bones by the miners in 2008, during the process of hydraulic stripping of the earth actually forced the scientists to change their theory. These bones were preserved exceptionally well in the permafrost wherein they still held DNA, which is one of the rare occurrence in mineralized fossils. Zazula said: "When that was found, we really couldn’t believe it because, like I said, there hasn’t been a camel bone found in over 30 years, and we knew they were so rare and it was so well preserved." As per the report from Guardian, Zazula said that he sent small pieces of the bone to geneticists at the University of California Santa Cruz, which were later assisted by a statistician and a geologist. The journal Molecular Biology and Evolution has published the findings of this study. The news release regarding the DNA testing indicated that around 10 million years ago, western camels seems to have split off from the branch which includes modern camels. Though most of them lived in southern areas of North America, some might have made their way north during the warm period around the last ice age which is about 100,000 years ago. It seems these animals then remained in North America till the end of ice age when they actually went extinct. "There's something pretty spectacular about holding on to a bone that's 100,000 years old that can tell us so much about the history of the past and the history of the land you live in," said Zazula. "I think that's pretty spectacular." Zazula says that these findings would definitely make scientists re examine other species as well.